Do you have an inside cat that would love to be outside? Here's the solution,RORAIMA Portable Cat Tent. This cat tent is nice and roomy, 75"L x 60"W x 36"H, plenty big enough for 2 or more cats, their toys, food and water bowls and litter box. 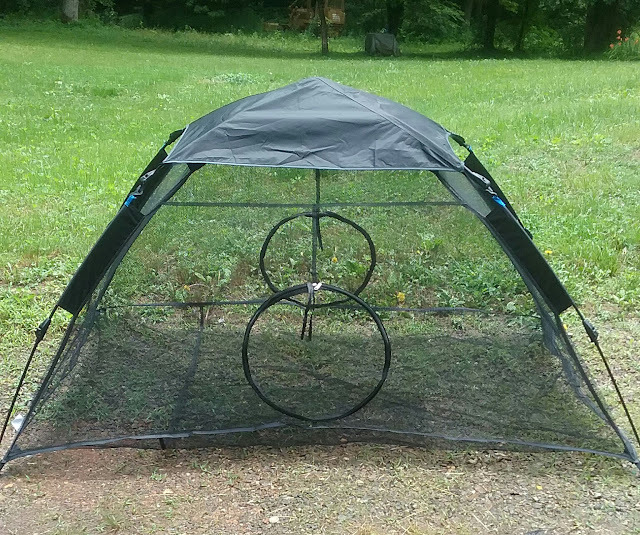 This cat tent is perfect for the yard, the deck or porch or even to take camping. It sets up literally in seconds and has carrying case making it handy to take with you and it doesn't take up much space. The extra rain guard keeps the tent dry and also shady. The tent has 2 zippered openings making it easy to get kitty in or out. The round zippered make it easy to join 2 tents together with a 17" cat tunnel that can be purchased seperately. You can make a kitty city. The mesh material this tent is made from allows great ventillation while keeping your kitty safe from bugs and spiders while confined from running away or being harmed. If you cat happens to be sensitive to grass, simply lay a blanket under the tent before assembly. This tent can be used indoors as well to keep your kitty from jumping and running around the house. I recceived this product at a discount to facilitate this review.